I love nothing better than a hot bath on a cold day. Add in a few candles and a good book and that's me sorted for the best part of an hour! I've used bath bombs from Lush before but The Comforter is my first foray into their bubble bars. Firstly, the smell is incredible. In the bag, The Comforter smells of parma violets but once crumbled into hot running water it gives off a gorgeous blackcurrant aroma. I use a small amount of the product for a single bath; no more than the size of a 50p. This is enough to turn my bath water bright pink and create lots of lovely bubbles. My skin also feels soft and moisturised afterwards, and the blackcurrant scent lingers for a while too. In the photo above, I've probably used about a third of the whole bar and got four or five baths out it already. At £4.25, The Comforter is definitely good value for money. Overall, my first experience with bubble bars from Lush has been an entirely pleasurable one! I'll certainly be trying more of them in the future. At the moment, I've got my eyes on A French Kiss; a purple and white lavender infused bubble bar. Are you a fan of Lush's bubble bars? Jane Laced chose your blog to give the liebster Award to! I need to try this as I have been recommended so many times. It lasts so long too! 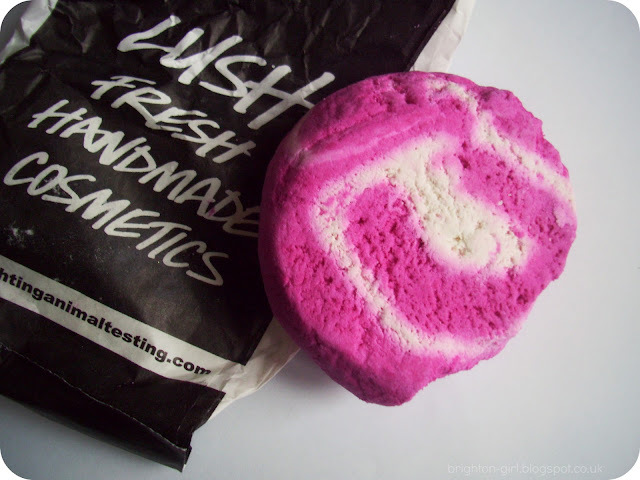 I used this bubble bar a few years back and remember loving it! Such a nice scent and pretty to look at :) Glad you're loving it too! This looks amazing! I think I might have to get one of these soon. I love your blog, I'm a new follower and looking forward to reading more posts by you.